The weather this summer is fantastic. Every weekend feels like you are on holidays. It is just amazing! Simply perfect for outdoor cooking. But even I can eventually get bored with barbeque. It’s hard to believe, isn’t it! To have a break from the constant charcoal smoke I decided last weekend to cook inside. I wanted to stay with the summer theme though. And what is more summery than exotic fruit such as mango. Combine it with chilli and the result was clean, vibrant and crisp flavour. It was a winner! Perfect accompaniment to the pan fried sea bass fillet. 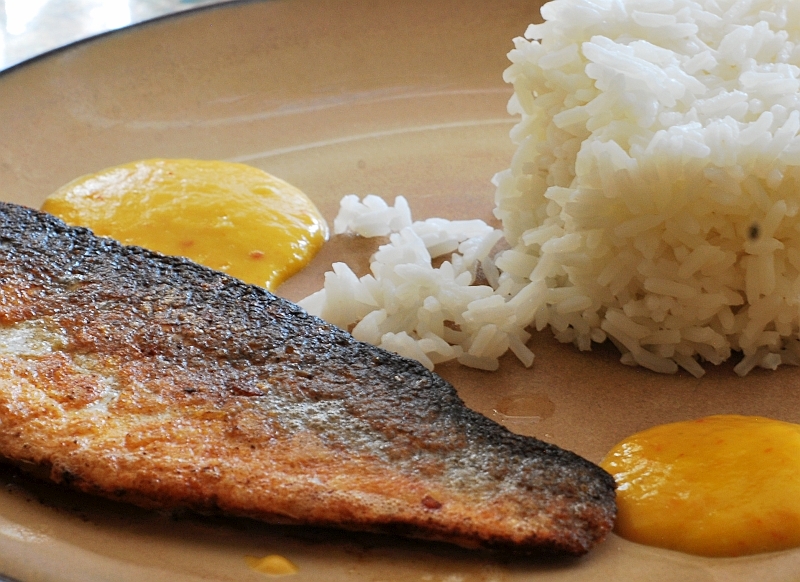 The sauce will also work with other meaty white fish such as sea bream, monkfish or even cod. If you don’t like fish try it with chicken breast! Make the sauce: put the orange juice, lime juice and zest, mango and vinegar into a small saucepan. Bring to boil and simmer for about 4 – 5 minutes, or until the liquid on the bottom of the pan has reduced to about 2 tablespoons. Pour the contents of the saucepan into a liquidizer and blitz it to a fine purée. Return the purée to the saucepan. Add the cream, garlic and chilli and mix until all ingredients combine. Bring to boil, then reduce the heat and simmer for 1 minute. Remove the pan from the heat and season to taste. Keep warm whilst the fish cooks. Meanwhile pat dry the sea bass with kitchen towels and pin bone if necessary. Put the oil and butter into a large non stick frying pan and set over a medium heat. 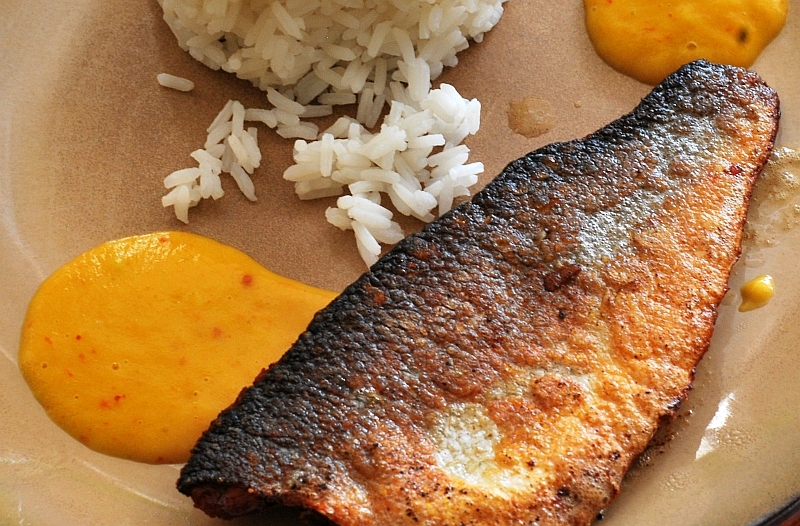 When the butter is starting to foam place the fish fillets skin side up and fry for about 1 – 2 minutes. Turn the fillets over and fry for another 3 – 4 minutes, or until the skin turns golden brown and crispy. Baste the exposed meat with melted butter from time to time. To serve spoon a little of the sauce on to each of 4 individual pre heated plates. Arrange sea bass fillet on each plate. Serve with boiled rice and a chilled glass of pinot gris.